As one of the nation’s fastest-growing counties and the third-largest county in Missouri, St. Charles County has faced significant transportation challenges over the last decade. In response to growing transportation needs, a half-cent sales tax was enacted by voters in 1985 and has been reauthorized three times. The sales tax provides approximately $20 million annually to fund road improvement projects throughout the county. These funds are used to enhance the mobility and safety of all roadways within the county, regardless of the maintaining agency. The funds are used for a variety of project types, including new roads, road widening and reconstruction, traffic flow and safety improvements, and projects driven by economic development. With a population nearing 400,000, St. Charles County has grown at a pace almost 10 times faster than that of the overall metropolitan St. Louis region since the year 2000. It currently makes up more than 15% of the region’s overall population of 2.59 million. Bordered by two major rivers—the Missouri and the Mississippi—and consisting of large areas of flood plain, the majority of the county’s population is located within or near the “golden triangle” with borders of I-70 to the north, I-64 to the southwest and the Missouri River to the east. Four river crossings carry approximately 400,000 vehicles each day between St. Charles and St. Louis counties, making each of these routes critical to the region. 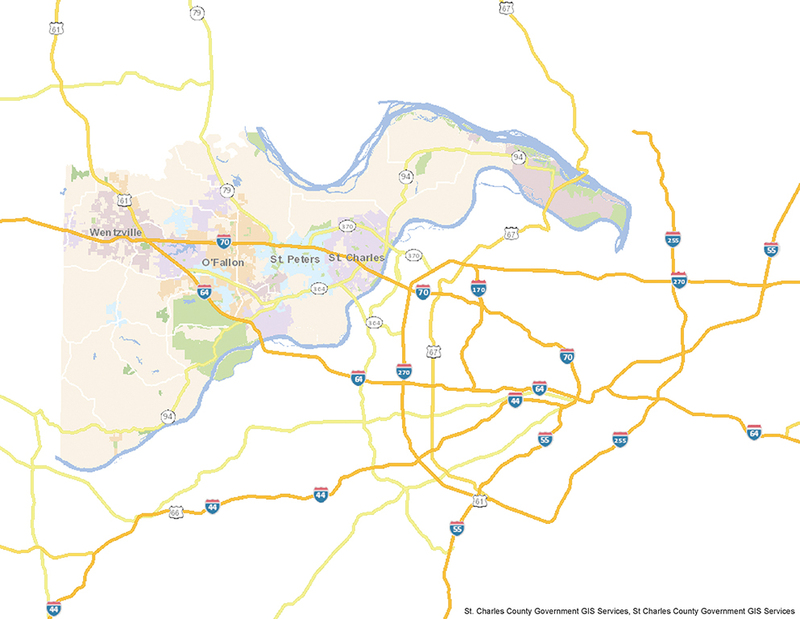 While each of the river crossings are interstates or freeways maintained by the Missouri Department of Transportation (MoDOT), the critical arterials connecting them are signalized corridors owned by multiple jurisdictions. This leads to major challenges in signal coordination and overall traffic management. With minimal opportunities for expansion, the county brought together its eight major municipalities, MoDOT, and the East-West Gateway Council of Governments to form Gateway Green Light (GGL) and more effectively handle increasing congestion and delay on the area’s arterial network. The member agencies began holding stakeholder meetings in 2009. With the goals of reduced travel times and delay, along with increased mobility and reliability of travel throughout the county, GGL set out to build a communication network to support a county-wide advanced traffic management system (ATMS). The program supplies and installs supporting intelligent transportation system (ITS) devices such as pan-tilt-zoom (PTZ) cameras, count stations, travel-time sensors and dynamic message signs (DMS) throughout the system; develops and optimizes coordinated signal-timing plans; and monitors traffic during peak hours. The initial Congestion Mitigation and Air Quality Improvement (CMAQ) funding application requested $4 million in CMAQ funds, with a $1 million match provided by the county’s transportation sales tax, for a proposed $5 million project with construction in FY 2013. Now referred to as Phase 1, the initial project includes the selection of ATMS software, expansion of the existing fiber and wireless networks to connect the 334 traffic signals within the county, controller upgrades, numerous additional ITS devices, optimized signal coordination on 22 corridors, and a master plan document. Phase 1 support services are now complete, closing out the initial phase of work. Since the initial project, the county has been awarded additional funding of more than $12.5 million for further improvements in five additional project phases. The funded improvements include fiber network expansion, additional ITS devices, ATMS enhancements, signal and ITS upgrades, emergency vehicle priority and an update to the master plan document. GGL Phase 2 is substantially complete, while GGL Phase 3 construction and GGL Phase 4 design currently are underway, and GGL Phases 5 and 6 will begin over the next two years. The current ATMS network in St. Charles includes 125 miles of fiber, 27 cellular locations and 11 point-to-point radios connecting all 340 signals. The current network includes 125 miles of fiber, 27 cellular locations and 11 point-to-point radios connecting all 340 signals within the county. Devices include 90 travel-time detectors, 145 closed-circuit televisions (CCTVs), three DMS and 118 intersections providing high-resolution data collection. Through the use of the centralized ATMS software, each GGL member agency has the ability to monitor its intersections and make changes remotely. Agencies now can be more proactive in identifying signal-related issues before citizens call them in and have the ability to receive various alarms related to the status of signal operation. Using the ATMS software and PTZ cameras, members can validate the alarm received and collect crucial data to provide to an electrician/technician before they are dispatched, streamlining the repair process. GGL partners continue to explore opportunities to improve signal operations and are eager to use new technologies wherever possible. Recently, the traffic responsive signal operation was implemented to accommodate the increased vehicle demand on the signal system following concerts and programs at the area’s event venue. 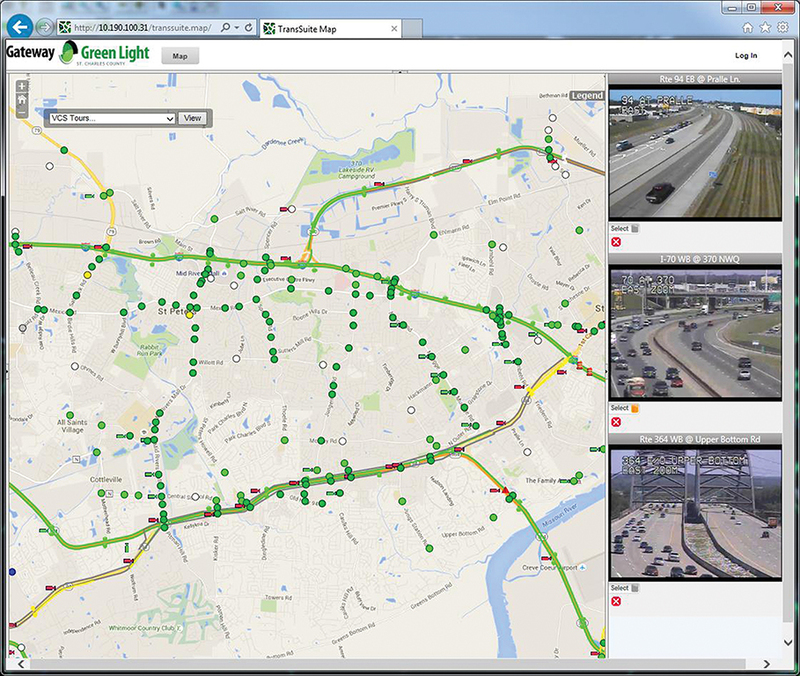 Utilizing the video-detection system to collect turning movement counts, the central software uses volumes to trigger the activation of event timing plans at several adjacent signals, allowing patrons to access interstates and freeways in a more efficient manner following an event. As the parking lot clears out and volumes decrease, the signals return to normal operating conditions. The success of this traffic-responsive operation for event timings has led to implementation at other locations. Traffic-responsive operation is being used to call the appropriate pattern during the morning, evening and weekend peak periods on a state arterial with an annual average daily traffic (AADT) of 52,000. Information collected from the travel-time system indicates a reduction in travel time during these periods. Traffic-responsive operations also are being used at an isolated intersection on an arterial that is commonly used as a diversion route to call an event-timing pattern. This allows additional green time to the movement as demand increases. The central ATMS software also allows remote changes of signal-timing patterns when there is an incident on the interstate resulting in a full closure. However, vehicles may be diverted onto an arterial network of signals which are likely operating with timing patterns not suitable for the demand. An Arterial Management Interface (AMI) was developed for the county and serves as a guide in selecting the appropriate pre-developed signal-timing pattern. The AMI contains patterns developed for various diversion routes that can be used during a closure. The GGL operator monitors the signals adjacent to the incident on the PTZ cameras and determines where a diversion pattern is required. As the demand begins to disperse, the signals are returned to their normal programming. Map of St. Charles County from GGL’s advanced traffic management system. A recent customer survey shows that more than 70% of respondents perceived congestion on the county’s roadways to be predominantly on signalized roadways. This confirms that the program is needed; the goal now becomes how to illustrate the improvements it is making. The GGL program continues to expand its high-resolution data collection effort in order to take advantage of several signal performance metrics. Through the use of these tools, GGL partners monitor signal operations within a corridor and better adjust the splits and offsets to achieve optimal performance. Performance goals are set and measured to provide quantifiable benefits of the program to stakeholders, local officials and citizens. GGL also has incorporated applications that allow for simplified analysis and improved presentation options for the turning-movement count data collected through the vehicle detection system, and travel-time data collected through strategically placed sensors. Moving forward, the program is broadening its focus on user feedback and public outreach. Public perception is critical to the future of the program, and it is imperative to effectively demonstrate the benefits provided to county citizens. The most recently funded phase of the program includes system-wide emergency vehicle priority. The proposed solution would allow the equipped emergency vehicles to activate intersection signals via the ATMS software, as opposed to a direct connection to the intersection signal controller. This eliminates the need to add a pre-emption device at all 340 controllers in the county and would result in substantial cost savings. This technology provides for greater oversight regarding when and how emergency vehicles are using pre-emption technology and minimizes overall traffic impacts. Additionally, the system allows for cross-agency interoperability, supporting any control requirement such as multiple fire, police and EMS departments, public transit and public utilities. GGL partners are enthusiastically looking to the future and the vast array of emerging technologies. The knowledge gained through the coordination of the partnership is laying the groundwork to propel the GGL program into infrastructure and new vehicle technologies. Recent improvements to the travel-time devices allow signal phasing and timing information to be broadcast from the intersection to devices configured to receive and display this information inside the vehicle. The current phase of the GGL project includes an update to the master plan document. Much of this update is expected to focus on emerging technologies and the future of transportation. The first phases of the GGL program provided the base infrastructure and fiber backbone needed to incorporate much of the emerging transportation technologies. Additionally, the program recently garnered interest from other departments within local agencies. The existing fiber backbone provides a portion of the network to connect one local school district to a lower-cost internet provider. A planned overbuilt network allows for this additional use, which could be implemented by the county’s other school districts and additional public service entities. The possibilities of future network uses are endless, and the GGL program provides the network infrastructure needed to allow for quicker implementation of new technologies as they become available. This enables St. Charles County to be at the forefront of the evolution in transportation technology. Brauer is the St. Charles County Manager of Roads and Traffic. Laxton is a traffic engineer, GGL Support Services, with CBB Transportation.